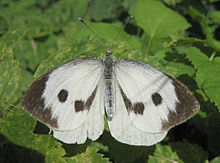 Pieris brassicae, the French butterflee, an aa cried lairge white, cabbitch butterflee, cabbitch white, cabbitch moch (erroneously), or in Indie the lairge cabbitch white, is a butterflee in the faimily Pieridae. It is a close relative o the smaw white, Pieris rapae. This page wis last eeditit on 3 Apryle 2017, at 21:57.